Interestingly and possibly a little sad for our family is that this is our third Easter away from family and away from our home culture in the United States. We did not dye eggs last night. We did not hide them and seek them today. And perhaps the strangest part is that our kids did not mention it a bit. They did not talk about egg hunts or candy. I don’t know if they even remembered, and they certainly did not miss them. I think I missed it all, and I think I was a little sad that they did not. What we did do is have a breakfast with all the missionaries. Then the mission invited all the local (very small) churches in our town to come together for an Easter service celebration at the school. 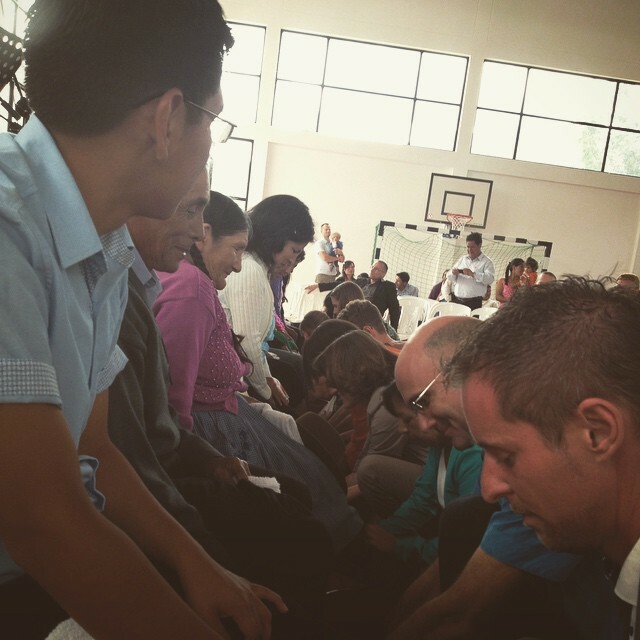 The service ended with a foot washing as the missionaries washed the feet of the people we are here to serve. This is indeed a symbolic act, as most of us are not looked on as servants. We hold a place of esteem in our community as teachers, doctors, and frankly “white” people. It is an undeserved honor, but it is the way it is. So the missionaries washed the feet of those we came to serve. It is not the step down of humility it was for Jesus. He truly was more than his disciples while we are equal with those whose feet we were washing; yet hopefully it was picture of who Jesus was and is. And hopefully if demonstrated how we want to be seen in Curahuasi. When David and I went out on a bike ride we opened the gate and saw half of a jawbone! We took a good look at it, and then set off for our ride. We went to the store down in town and bought a sour gum called “Bobuloo”! We like this gum because it is sweet and sour. There is a man in our town called “El Canero” which means, the flute player. He always carries a flute in his hand, wears his cap backwards, and talks to himself. He is always drunk! That is why people are scared of him. He walked by the store where David and I were. Our bikes were outside of the store. I was worried that he was going to steal our bikes and go. David was worried that he was going to come and buy Chicha, which is an alcoholic drink. The woman in the store told me and David not to be afraid of him because he won’t do anything if you act like nothing is happening, if you don’t stare at him and if you act normal. So then, once he was away, we set off again. I told David, “I sort of want to go home now.” He said that was OK and that he would go home with me. So while we were riding home, we went past the “street of the dogs”. There are so many dogs there! Peter’s enemy dog (we call the dogs we don’t like “enemy dogs”) – I didn’t think he was going to do anything, so I rode straight past him and he was very, very close to me. Suddenly I felt a tug. The mouth of a dog was pulling my favorite sweater, and it was that same dog! I looked back and saw that he thought it was a toy. He pulled and pulled until I pulled it out of his mouth. He put a hole in my sweater! After that I called for David. I started to cry. I was not hurt. I was just so scared! A guy that was sitting on his doorstep asked what was going on. David told him that I got scared, that I wasn’t hurt, that I was fine. The man understood. And then we kept on going. At the very end, as we were getting close to the house, David almost stepped on a very big bug. We thought it was a big bug, but it wasn’t just a big bug; it was two bugs. It was a bug that you sometimes see flying around the air in Curahuasi. And it was carrying a tarantula! David and I made it home safely this time. And also exhausted. Educating your kids in the mission field is for many of us a battle within ourselves to trust our most prized possessions to God. Some missionaries homeschool, but then their kids don’t learn the language or assimilate into the culture as well. Others send their kids to national schools, which can be good, but are often terrible. Bullying can be a real problem. Others send their kids away to boarding schools. There are many great boarding schools, but I cannot imagine how difficult that is for both parents and kids. Others build school that serve the local missionaries as well as the local population. That is what we are doing here. Our school is 90% Peruvian, and 10% missionary kids. For that reason we follow a Peruvian curriculum, not a German curriculum nor American. And it is so hard for us as parents to trust the curriculum. We are used to our cultural way of doing things, and honestly some of the ways they educate here seem crazy. There is a class called “Math Reasoning” that seems like a complete waste of our kids, their teachers, and our personal time. It is not an exaggeration to say that sometimes when I am helping my kids with this bit of homework, I want to quit being a missionary. Nothing makes me want to go home more than this little bit of curriculum. It sounds crazy, and to type it also makes me feel totally wimpy, but it is the truth. I start thinking about this wasted bit of educational time, then I imagine what else they are not learning, and then I think about the PSAT and SAT or ACT and I start to lose faith. God help me, a person of so little faith! But then we have these moments of light, when a school activity or science project goes well. Or we hear our kids speaking Spanish with their friends, and we realize how much they are learning in so many other ways. And I pray and I try to trust a little more. Bringing your kids to another country, especially a poor part of another country with few resources, is a challenge. It is hard for them, and it is hard for us parents. Please pray for us! Enjoy also this article from the Diospi Suayan Hospital website sharing a moment of light at school. The first picture has one of our favorite students! 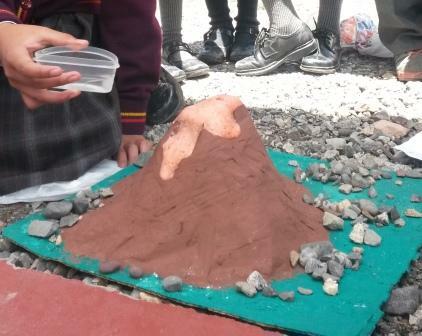 In the forth grade class of Colegio Diospi Suyana, the bright minds were asked to perform their own experiment and explain their findings. 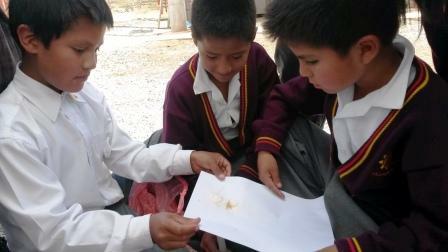 The school kids had soon finished their projects, which showed their great ingenuity. Abigail used food to create a volcanic eruption. 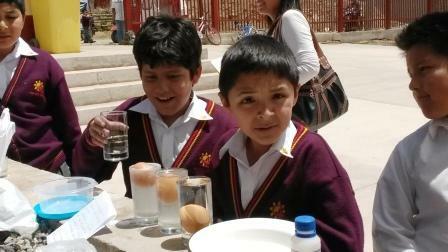 Bruno and Omar astonished their fellow students by demonstrating the floating differences using different salt solutions. A real problem in Curahuasi is the drinking water. Luis and Cesar were inspired by this to create a natural filter that turns murky soup into crystal clear water. However, Edy’s project created the greatest attention. He had built a miniature table saw, driven by the crankshaft via a battery that even cut wood sticks. 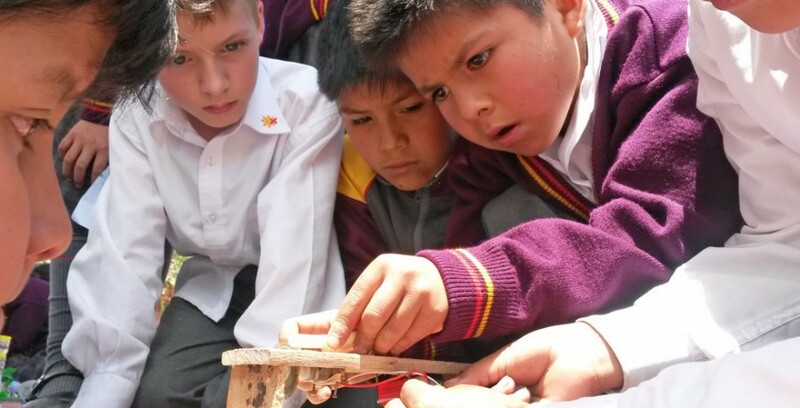 Teacher Jaquelin beamed with pride while looking in the faces of the student inventors. 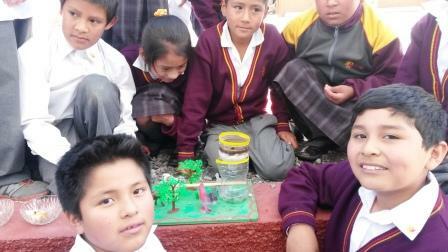 Everyone had a lot of fun while learning the practical aspects of the laws of nature. The natural sciences are an enourmously important department of a school. Through experiments and research projects, students can discover for themselves how awesome God created this world. By the way, our growing school is urgently looking for a well-trained biology, chemistry, or physics teacher who is able to use experiments and practical demonstrations to teach our young researchers. We are looking for a true pioneer, because he/she would invest several years in the classroom, developing and guiding the Peruvian colleagues. Pray someone will find and sign up with us! /C.B. Why does salt water cause the egg to rise to the top? Water filter made with cotton, wool, and soap. Secret messages painted with lemon appear using a candle.